Get a copy of Little Sunny today! Also available at Kitchen Arts & Letters, Blue Hill Books, Sherman’s Maine Coast Book Shops, Owl & Turtle Bookshop Café, Rooster Brother, and the Wing Luke Museum. What is it like growing up making kimchi at home? 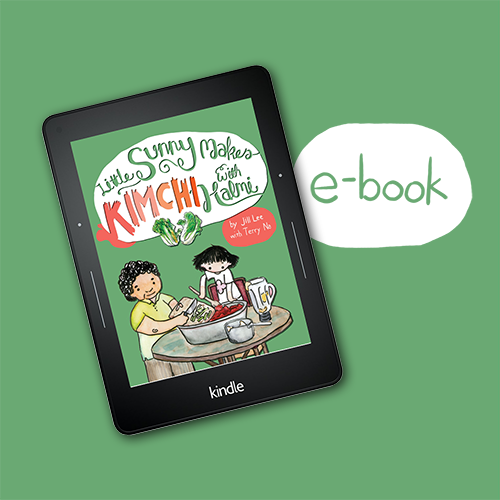 Little Sunny Makes Kimchi with Halmi takes readers through the experience as Sunny learns to make kimchi from her grandmother visiting from Korea. 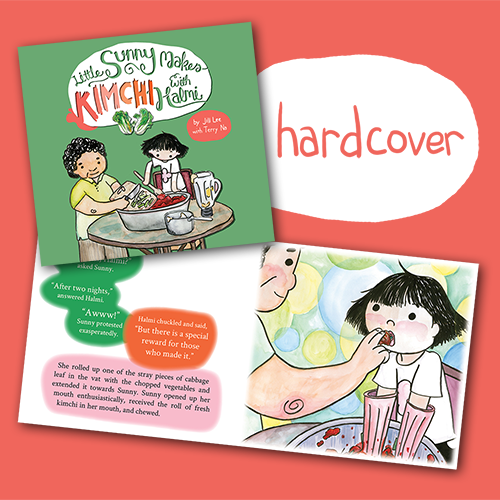 Little Sunny is a Korean-American girl living in an American town with her mom and her baby brother Tak. When Sunny’s and Tak’s grandmother Halmi comes for a visit, she brings with her a treasure trove of ingredients from her hometown in Korea and leads Sunny and Tak into the unique world of kimchi-making. Join Sunny in her foray into the world of kimchi, and you might just begin a kimchi-making tradition of your own. Jill Lee is a writer and illustrator whose childhood was spent in South Korea and the United States. She grew up watching Terry make kimchi in Ilsan, Oklahoma City, and Los Angeles. After leaving high school in L.A., Jill followed her love of nature and winter to Bar Harbor where she now spends her time cooking, writing, gaming, and botanizing. Terry Na is a chef who began fermenting cabbages and soybeans with her mother at the age of eight in her hometown Busan. After raising her two children Jill and Max, she launched her culinary career, introducing classical Korean cuisine to restaurants of New York City, Cape Cod, and Downeast Maine. She now splits her time between Maine and Korea, continuously perfecting her kimchi recipe. Sign up for our newsletter below to receive updates about new stockists, Little Sunny events, and more.